Manchester City are moving closer to completing a deal for Napoli midfielder Jorginho, with his agent waiting for a phone call to meet Manchester City directors, according to Calciomercato. As per the report, the midfielder is on holiday in Brazil, however, his agent Joao Santos – who is in England – has hinted that his client will move closer to the Premier League champions once they meet the demands of the Italian club. When Santos receives the phone call from the Napoli hierarchy, he will be then be given the green light to negotiate the Italian’s protracted move to Manchester. “City are working to satisfy Naples’s demands,” Joao Santos explained on Radio Kiss Kiss Naples, as re-reported by Calciomercato. According to Sky Sports, last week Jorginho, was said to be moving closer towards a £46.5m switch to join Man City this summer. 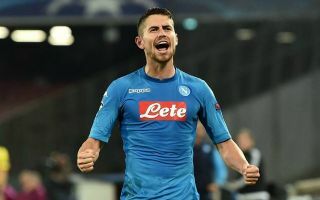 Jorginho arrived at Napoli in January of 2014, for €10m, from Hellas Verona, and his impressive performances in Serie A have seen him linked with some of Europe’s top clubs, including Manchester City and Manchester Utd, according to Goal. He is one of the best distributors in Europe and is a deep-lying playmaker, and the Brazil-born Italy international has scored two goals in Serie A this season, creating 44 chances with four assists. According to Squawka, he has completed 2489 passes this season with a pass accuracy of 89% – and the midfield star could be an ideal as a long-term replacement for ageing City star Fernandinho and Yaya Toure.